The daughter of a friend of mine has recently acquired a pair of rabbits which gave me lots of ideas of what to give as a Christmas gift. 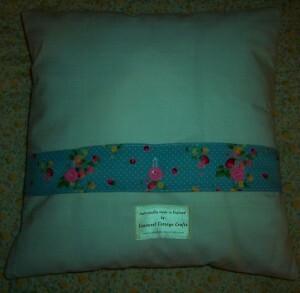 In addition to a decorated mug, I decided to add a cushion which she can display in her bedroom. 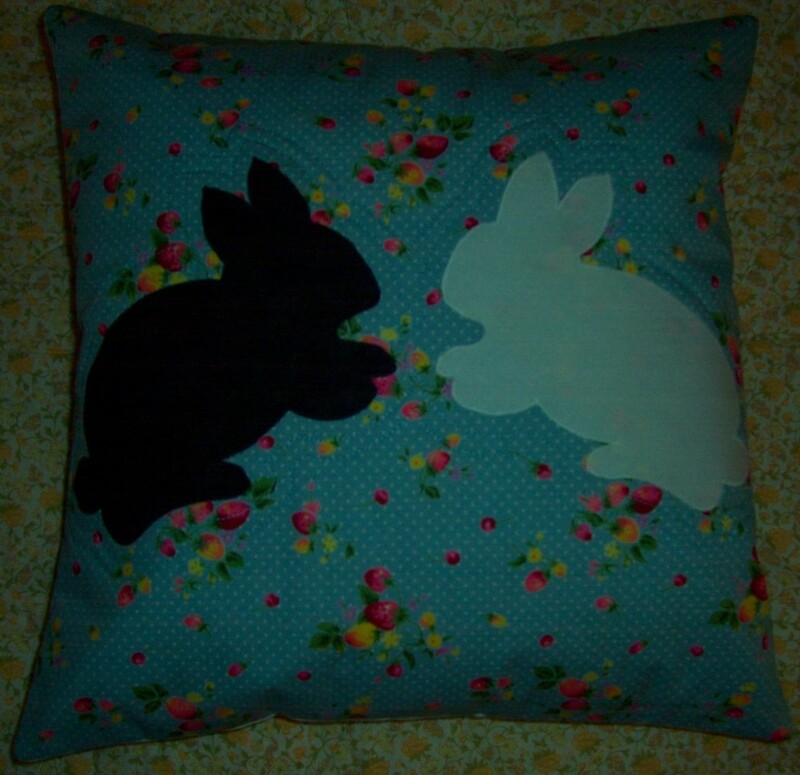 The rabbits are one in Black and one in White appliqued onto an attractive floral print cotton with a Blue background. Although I lined the White Rabbit fabric with extra stabiliser I notice there is just a very slight show-through of the print but otherwise I think that they sit well on this background. I used a light fusible wadding for the front of the cushion and quilted 1/4″ around the edges of the rabbits plus a row of echo quilting to make the bunnies stand out. The reverse of the cover has a button closure with my favourite method of print binding on the buttonhole band. The cover measures 15″ and the cushion pad is polyester filled. Here is the second scarf knitted in Blackberry stitch. 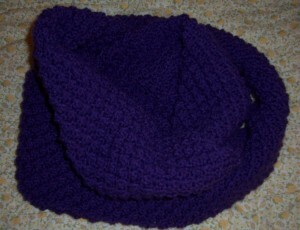 I am really enjoying these projects and having finished the Purple have moved onto Teal. 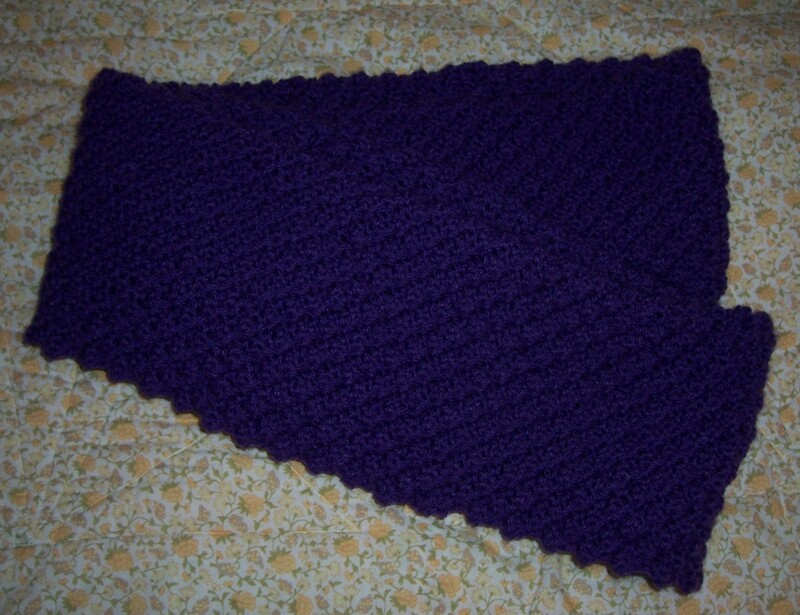 There is a slight issue with the number of stitches knitted in the Purple scarf – not an ideal colour to be using in these long dark evenings and I went slightly wrong by knitting extra stitches into the pattern. This has made the edges slightly “wonky” but by the time I had completed the full 60 inches the number of stitches was back to the original 68! As the scarf is folded the wonky edges don’t show – but because it is not perfect I cannot give it as a gift and will have to keep it for myself – it co-ordinates well with my Purple padded coat and jeans so – result!! 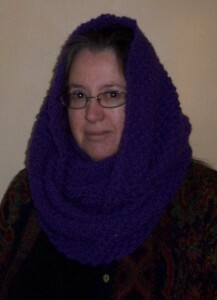 The scarf is really versatile as it can be worn over the head to help keep out the draughts – see the final photo below.